A long time ago I bought a cookbook, I think I’ve only made 3 recipes from it, but one of them is pizza. The book is Trattoria by Patricia Wells. It has hundreds of recipes for traditional Italian fare. Italian is probably my favourite, so once I got my pizza stone out of storage I decided to make some pizza. 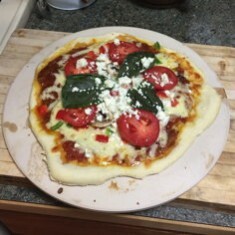 I bought special flour from a bakery on Commercial Drive and finally got around to the two day process of making pizza. It takes two days to make pizza the traditional way because you must make the dough and let it rise for several hours, it is best to let it rise overnight. The dough is actually the most difficult part of making pizza. You need to kneed it, you also need to be careful transferring the dough to and from the stone. A pizza stone is my secret weapon to making pizza. The dough has to be flattened out as thin as reasonably possible and by preheating the stone and then cooking the pizza on it, you get a crispier crust. The first pizza I made in about a decade should have been cooked a minute or two longer. We also did not make our sauce perfectly. I subcontracted out making the sauce to my mom and something went wrong. We tried to make a double batch and I think we may have added too much oil, the sauce had trouble thickening, but it was nothing we couldn’t overcome. Day two of the pizza making mission involves separating the dough into 3 or 4 equal sized balls. You need to flatten one ball, a rolling pin definitely helps as does ample flour to avoid sticking. As I said previously the dough is the most problematic, transferring your flattened ball of dough to a preheated piece of stone for instance. Toppings play third string according to Patricia Wells behind the dough and the sauce. My advice when making pasta sauce or most any Italian recipe is more garlic. Sautéing onions and garlic in olive oil is a skill you need to develop to make all kinds of sauces, I believe my bourbon BarBQ sauce also involved this step. My pizza recipe involved no alcohol though I did enjoy a beer after the dough was successfully in the fridge. You need to apply your sauce leaving a small border of dough. Turning up the edge of the dough is also an option, but if you’re going for that hand made rustic look and using a heated stone, you probably should just be happy with a circular shaped pizza. Toppings are basically up to you, but don’t go overboard. Three or four different toppings make the best pizzas in my opinion, my mom had about half dozen different toppings she brought from the store. I let her choose the toppings. Some toppings have to be added later in the cooking process. Fresh tomatoes for example go on late and some toppings like fresh basil should go on after the pizza is finished cooking. Tomorrow we’re putting pineapple on our pizza, apparently Hawaiian pizza was invented in Canada, I don’t understand it’s appeal, but my mom and sister both like it so tomorrow we’re making an even more mom influenced pizza. The dough recipe makes enough for three or four small pizzas. One pizza can be a meal for two when served with salad, but another way of using a small pizza is as an appetizer at a party, you can make it during a football game easily. It only takes 10 to 15 minutes to cook the pizza but it takes a long time to flatten the dough, plus apply the toppings. Any idiot can put the toppings on, be careful removing the stone from the oven and the pizza from the stone. Pictured below is the second “Hawaiian style” pizza we made, note the pineapple chunks. This entry was originaly posted on December 8th, 2014 , it was last edited on September 11th, 2016 and is filed under: The Good, The Bad, & The Ugly and tagged: Cooking, Patricia Wells, Recipe.